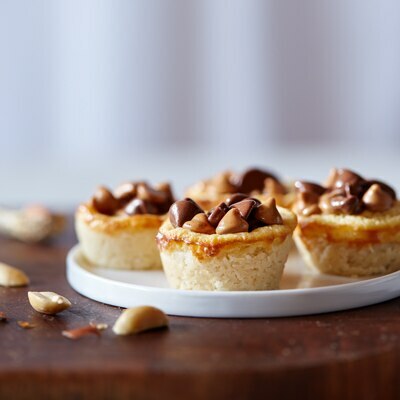 Surprise your family with these delicious cookie cups filled with peanut butter & milk chocolate morsels. PREHEAT oven to 350° F. Heavily grease 36 mini-muffin cups. BEAT butter and sugar in small mixer bowl until creamy. Add flour; beat until mixture is evenly moist and crumbly. Roll rounded teaspoon dough into ball; press onto bottom and halfway up side of muffin cup. Repeat with remaining dough. Place 5 morsels in each cup. BEAT eggs in medium bowl with wire whisk. Stir in sweetened condensed milk and vanilla extract. Spoon into muffin cups, filling almost to the top of each cup. BAKE for 15 to 18 minutes or until centers are puffed and edges are just beginning to brown. Remove from oven to wire rack(s). Gently run knife around edges of cookies. Let centers flatten. While still warm, top cookies with half of remaining morsels (they will soften and retain their shape). Repeat with remaining morsels. Cool completely in pan on wire rack. With tip of knife, release cookies from cups.